We moved in June 2009 in the countryside in a house with a garden. Lucky, Australian Shepherd 3 years, who has lived in an apartment with us, will have its garden. 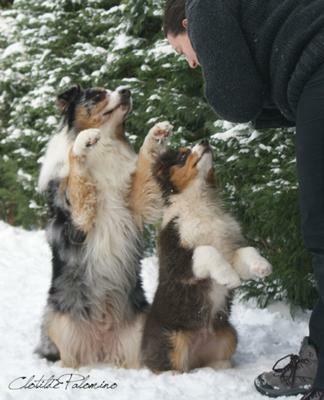 We want a second Australian shepherd because we love the breed but also for Lucky who has a "little brother". Gibbs arrived in November 2009 with us. A 3 ½ months, he can do many things like standing balanced on the hind legs. Lucky whispered in the ear of Gibbs? Sorry my english is not very perfect.